When I’m not eating or writing, I’m likely to be reading. Recently, I decided to read not just about food but about cooking and eating. I started with Anthony Bourdain‘s Kitchen Confidential and so enjoyed it that I soon after read the sequel, Medium Raw: A Bloody Valentine to the World of Food and the People Who Cook. Essentially, they form the first and second part of an autobiography but they are very different books. Much has happened to Bourdain in the time between the first was published and he started writing the second. There’s about ten years between the end of Kitchen Confidential and Medium Raw. In that time Bourdain’s life has changed dramatically: he’s stopped cooking, stopped drugs, divorced and remarried, had a child, worked in television, written another couple of books, travelled the world and eaten it. The fire that made Kitchen Confidential blaze has calmed down to a gentle smoulder. 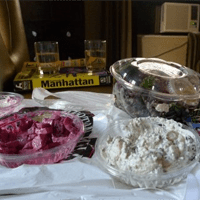 Eating in N.Y: I couldn't afford Les Halles. Kitchen Confidential introduces us to restaurants in the US and New York in particular. Bourdain’s hard-guy speak is entertaining, forthright and fast. He speaks with the voice of a N.Y. hard guy, someone who has been around. (Get the audio book, which Bourdain himself narrates, and listen to it while cooking. He’s got a really good voice.) Bourdain takes us to restaurants seedy and spectacular and shares industry secrets. He shares his own secrets too, both from Les Halles where he works and his life of drugs and drink. We find out a lot about how kitchens work. They are not places I’d want to work: they’re too macho, too strident. It’s fun finding out about them, though. And I enjoyed the conceit that this was a book the restaurant world wouldn’t want me to read and certainly didn’t want Bourdain to write. The first book was the work of an angry young man. A man Bourdain describes in the second book as digging himself into a hole, with no security and nowhere to go. The second book is written by a man who built a ladder and got himself out of that hole, out to a position of security where he’s having just as much fun, but different fun. The angry young man grew up. Medium Raw could be a comment on the content of book. If Kitchen Confidential was blue, Medium Raw is, well, just that. The more grown-up, less irate Bourdain is a less entertaining read, to me, but I am kind of pleased that he sorted himself out and that he’s now in a good place. This book taught me something about how food television works and something about publishing. It told me a lot about Bourdain himself. He’s a good guy, don’t get me wrong, still a tough-talking, walk-walking guy. He’s not a chef anymore, though. That’s a young man’s game and young he is no longer. Now he eats. And so do I. I was more thoroughly entertained when we were on different sides of the table. As a historical document and an entertaining read for people who want to stay out of the kitchen, I’d recommend Kitchen Confidential. For anyone who wants to know what could happen when you’re too old for the kitchen, a chef’s Cinderella story, if you like, Medium Raw is not a bad read. They are both entertaining enough for enjoying in front of a real or imagined roaring fire, with a whisky and gingerbread this Christmas.